This is a four-part major series on New Zealand’s wines. Part I incudes a series of spotlight features on some of NZ’s major wine developments, part II visits the North Island, and there’s a tasting of 180 New Zealand Pinot Noirs in part IV. The crossing from the North to South Islands can be a dramatic one. I crossed the Cook Strait twice on my tour, first by air, and then by sea. The flight was as lumpy and bumpy as any I’ve been on, but the sea was glacial on my Interislander ferry crossing (which is not always the case). This was a lovely two-and-a-half hour experience, leaving the stimulating capital city of Wellington with the wonderful Te Papa Museum of New Zealand and superb restaurants behind, and heading for the stunning Marlborough Sounds. The ferry docks in Picton, a small town on the northeast tip of South Island, and from here you are just minutes away from the Marlborough or Nelson wine regions. 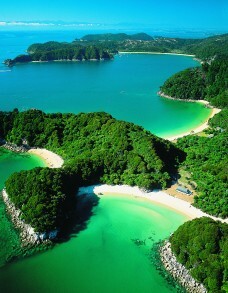 Right: Abel Tasman National Park, Nelson (photograph by Ian Trafford). The contrast between the sub-tropical exoticism of the North Island and the Alpine freshness of the South Island is astonishing. The North, with its volcanoes, thermal springs and lush vegetation is replaced by a landscape dominated by the Southern Alps, of which Aoraki (Mount Cook) at 3754 metres is the highest, though there are 18 peaks over 3000 metres. The Southern Alps also divide the South Island into a rainy and squally west, whereas the east – where all vineyards are located – enjoys wonderfully clear, bright, sunny skies. Whilst Nelson, Marlborough and Canterbury lie towards the coast, Central Otago lies amongst high hills and mountains. Though it enjoys hot, dry summers, it is a popular winter ski area, with very cold conditions. Its buzzing resort of Queenstown sits on the shores of Lake Wakatipu, and is Adventure Central for the bungee-jumping, white-water-rafting thrill-seeker. 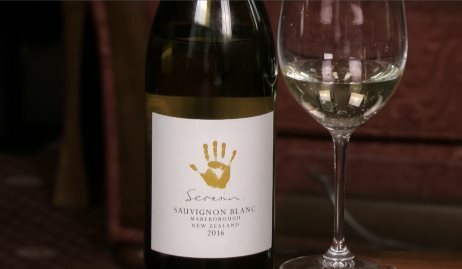 Marlborough has carved its name on doing one thing absolutely brilliantly, and that one thing is Sauvignon Blanc. The pungent, vivacious style of Sauvignon from here is arguably the greatest success story of New World wine. No other region has quite managed to match, if not eclipse, its European role-models quite so successfully. But of course there is an awful lot more to Marlborough. As well as excellent wines from other grape varieties, the winemakers are also defining the land much more closely, establishing sub-regions within Marlborough to tweak extra quality and refinement in the fruit. Individual profiles follow, but my South Island adventure began with a regional tasting of 30 Marlborough wines from dozens of estates. My visit to Seresin was an undoubted highlight of my trip. Having toured the vineyards, we jumped into a motor-launch to travel through the Marlborough Sounds to Waterfall Bay, home of Seresin’s owner Michael Seresin (right). This house, with its own private jetty and breathtaking setting, looking straight out to the Sounds, is the New Zealand base for Englishman Michael, one of the world’s top Cinematographers, whose credits include the filming of Bugsy Malone, Midnight Express and Harry Potter and the Prisoner of Azkaban. Though professing to have “no real palate,” Michael is also passionate about wine. A few hours in his company is enough to be certain that he has a big hand in shaping the philosophy of the estate and the style of the wines. 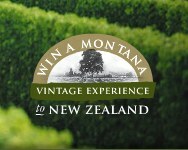 The estate was founded in 1982, and its logo is taken from a handprint found on a stone near the vineyards, said to be “a symbol of the individual and of creative endeavour.” The team here seeks to express a “true Marlborough character,” with organically grown vines that are hand-tended, with some wines fermented with wild yeasts. Seresin also produces premium extra virgin olive oils. In the early 1990’s they imported olive plants from Tuscany, and each year a Tuscan-based expert supervise the harvest and pressing. 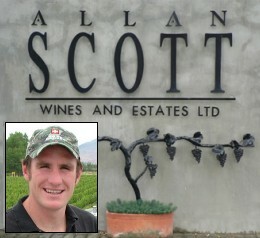 Next stop on my Marlborough tour was to Allan Scott where I was greeted by Allan’s son Josh. This is very firmly a family company, with dad Allan as CEO, his wife Catherine in charge of sales, and daughters Sara and Victoria in charge of viticulture and public relations respectively. Josh (inset, left) is winemaker, and has worked stages in Sancerre (for Dagenau, Bourgeois and Joseph Mellot) Corbières, and with Saintsbury in Carneros. 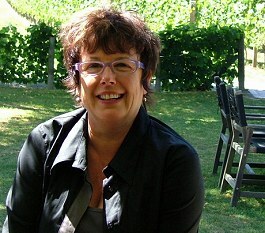 Allan founded the company in 1990, after two decades working in the wine industry. The four estate vineyards are on free-draining alluvial soils, the first of which was planted to Riesling in 1980. Fruit is also purchased from contract growers, with the company’s viticultural staff providing expertise and equipment. The large, modern winemaking facility on Jackson’s Road sits opposite Cloudy Bay, with temperature-controlled rooms for barrel fermentation and maturation. From the lovely balance and finesse of the wines across this range I guess there must be a steadying hand on the tiller from the older generation of Scott’s: Josh is a young buck who plays representative rugby and is a fierce competitor in multiple sports. In 2003 he established the Moa Beer Company, and I also toured his micro-brewery near to the winery, where he makes bottled conditioned beers using Champagne yeasts and methods. I had the opportunity here to don hard hat, high-visibility jacket and steel-capped boots to tour the enormous new wine-making facility that was nearing completion at the time of my visit. This facility alone – a NZD 70 million investment – is capable of producing more than 20 million litres of wine per annum, and the winery is crammed with clever technology, after years of research in wineries in California and South Australia. The roof, a huge 10,000 square metre expanse, gathers rain-water and diverts it to reservoirs, and the whole facility operates with high efficiency. The new winery is sited amongst 400 hectares of estate vineyards, though of course the company owns and contracts substantial amounts of additional fruit. Oyster Bay is part of the large Delegat’s group, and as one of Marlborough’s biggest players. As such, they have the scale to offer excellent wines at aggressive prices. 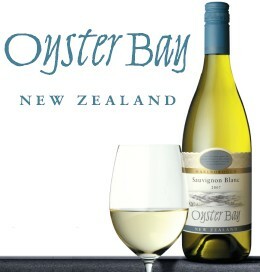 Whilst historically all New Zealand wines have commanded premium prices, Oyster Bay’s Marlborough Sauvignon Blanc can be found on promotion in the UK high street at £5.99, whilst the Pinot Noir can be bought for £8.99. In fact, I was told that company had a target of £7.99 for its Marlborough Pinot Noir. That must cause some concern to smaller producers with higher costs and far smaller volumes of wine. Montana is a giant of the New Zealand industry, and part of the Pernod-Ricard group. Though they have vineyards in Gisborne and Hawke’s Bay too, this tasting of wines from the Marlborough region took place with their Marlborough Winemaker Patrick Materman (pictured left) over an excellent dinner at Gibb’s Restaurant on Jackson’s Road. It focused on wines produced by Montana’s Brancott Estate in Marlborough, where they were pioneers of grape-growing, planting the first modern vineyards in this traditional sheep-farming region in 1973. Today, Montana is New Zealand’s largest wine producer. The Brancott winery, established in 1977 and so Marlborough’s oldest, is in many ways the foundation stone of the modern Marlborough wine industry. It has also been a centre for innovation and experiment, with the world’s first ‘tipping’ tanks installed in 2000, allowing marc to be decanted rather than being moved manually, and the first Coquard Champagne press in the southern hemisphere. It also houses some of the few large wooden cuves in New Zealand, as well as cellar holding more than 6500 oak barriques. The amiable John Forrest welcomed me to his lovely estate, the grounds filled with the marble sculptures of artist in residence, Timothy Mark. John started the estate in the mid eighties, having already bought 70 acres of land in Gimblett Gravels in Hawke’s Bay, with the intention of “eventually doing something with it.” He came to Marlborough for a weekend and met with friends who, over a bottle of Dry River Pinot Gris, happened to mention that the farm next door was for sale. Within a short time he had bought the vineyards. 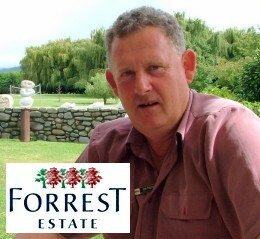 Forrest is now a sizeable operation, with 200 acres of vines in Marlborough and vineyards in Hawke’s Bay, Central Otago and Waitaki Valley. This is an extensive range – indeed two ranges as John has since launched a new premium wine label ‘The John Forrest Collection’ – including some excellent sweet wines (John has been the champion Botrytis Riesling maker in NZ for the past three years). He also commented on the relatively high alcohols of New World wines, saying that he looked forward to new yeasts that convert less alcohol. He looks back on his time as a winemaker, as yeasts became increasingly efficient, boosting the conversion to alcohol by an extra 10%. Arriving at Wither Hills operation in the Wairau Valley one cannot help but be impressed by the iconic winery and significant 300 hectares of superbly well maintained viticultural land. Opened in 2005, the building’s materials, colours and scale sit beautifully in its environment. As well as flexible winemaking cellars with plenty of open-top fermenters for their Pinot Noir, there are conference facilities and an extensive visitor and tasting centre. Son of its founder and long-time Chief Winemaker Brent Maris has now departed the company (which had become part of the giant Australian group, Lion Nathan, in 2002), and winemaker since April 2007 is Ben Glover. Ben’s experience has included vintages in Sonoma, Margaret River, Burgundy and Puglia. I was shown around by his assistant Nadine Cross, before tasting a small selection of their excellent wines. Owners Neal & Judy Ibbotson where both there to say hello and have some lunch on my visit to Saint Clair’s winery, though it was winemaker Hamish Clark who led me through an extensive tasting of 15 of their wines. 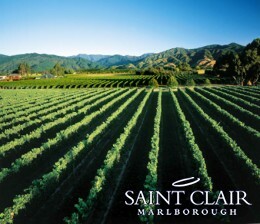 Saint Clair has vineyards in five different Marlborough locations, including the Rapaura, Awatere and Omaka Valleys, and sources fruit from contract growers. In 2001 they introduced a grading scheme for all wine batches, which can earn one to 10 for quality each year. This is providing valuable information on which vineyards and smaller parcels provide the best fruit, and on which varieties seem to perform best in each of the vineyards. The data feeds back into improving vineyard practices, and incentivising growers. Opened after my visit, a brand new winery has capacity to process 300 tons of grapes per day, and its array of high-tech systems will allow Saint Clair to build on their substantial sales of 180,000 cases annually. The bustling cellar door at Saint Clair includes a tasting room and shop, a casual café offering seasonal and local foods, and an art gallery. I visited Kim Crawford’s semi-industrial facility in Blenheim, where winemakers Jules Taylor and Matt Large led me through a tasting of their wines and quick tour of the facility. The Kim Crawford story begins in the 1990s, when Kim and Erica Crawford discussed their ideas of what the modern wine consumer wanted with David Gleave MW whilst visiting the UK. In 1996, the Kim Crawford brand existed with a ‘virtual winery’: grapes were purchased as they had no vineyards, wines were made at other wineries as they had no premises, and business was conducted from Kim and Erica’s Auckland home. The bulk of that initial 4,000 case production went to the UK, and the wine-making facility in Marlborough did not materialise until 2000, around the same time that the company finally acquired some vineyards of its own. The Kim Crawford brand – steered by the Crawfords – flourished over the next few years, until the giant Canadian company Vincor International acquired the brand in 2003. There is no public access to the Marlborough facility, but there is a tasting room and cellar door in Hastings on the North Island. 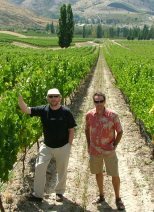 The initial impetus for my visit to New Zealand in 2006 was an invitation to join writer Allan Meadows as international guests of the Central Otago winemakers at their bi-annual Pinot Noir Celebration, an absolutely terrific event that celebrates Pinot from around the world. Otago is the world’s most southerly wine region, and has taken over the mantle of Pinot Central, not only for New Zealand, but also for the southern hemisphere. A Continental climate with hot summers, cold winters, and large diurnal shifts in daily temperature, combines with schist and clay soils to yield a beautiful purity of fruit. 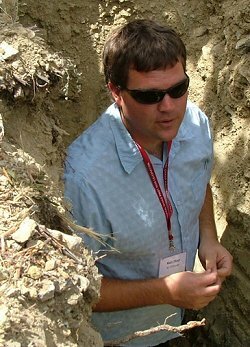 Right: winemaker Matt Dicey of Mount Difficulty gets down and dirty to explain the unique soil structure of his Central Otago vineyards. Nevis Bluff is the first of two estates whose wines are made at a large, central facility called The Central Otago Wine Company (which has a cellar door facility for visitors to taste and purchase its client’s wines). Winemaker is Dean Shaw, a Pinot Noir fanatic who led me around the multitude of nooks, crannies, and seemingly chaotic ‘wineries within wineries’ of this large operation that hand-crafts distinct wines on behalf of dozens of vineyard estates that are too small to have their own facility. Dean works with owners to create wines from their fruit, bearing their labels. 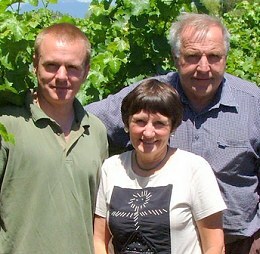 Nevis Bluff is owned by Martin and Kirstine Cook, and their Gibbston Valley vineyard operation takes its name from a nearby rock formation. Soils are mainly free draining loess, schist and loose gravel, and all vineyard work is done by hand. Planting is high-density, and vines are cropped low at 1.5 kilograms per vine. Dean Shaw makes the wines as naturally as possible, using wild yeasts for fermentation. The portfolio includes Pinot Noir, Pinot Gris, and from the 2006 vintage, a Reserve Pinot Noir. The regular Pinot spends 10 months in French oak barrels, 25% of which are new. The 2004 has just taken silver in the Air New Zealand awards. Pisa Moorings’ charming and forthright owner Sue Stark met me at The Central Otago Wine Company to taste through her wines in the company of winemaker Dean Shaw. Pisa Moorings is a Pinot Noir specialist, farming just 8 acres of vineyards on the western shores of Lake Dunstan. Sue and her viticulturist, Ian Cunliffe, believe the soil structure and microclimate here are particularly suited to the production of premium Pinot Noir. A newly-planted Pinot Gris vineyard will come on stream a few years from now. A similar “hand-off” winemaking approach is taken here, and the Pinots have won a string of medals, including silver in the International Wine Challenge for the current UK release, the 2004. I had a fine visit to Carrick in the company of Managing Director Steve Green and Winemaker Steve Davies. 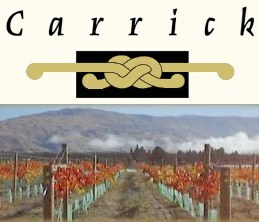 The winery and all of Carrick’s vineyards are all located in Bannockburn, on the Cairnmuir Terraces. The first was planted in 1994, to Pinot Noir, Chardonnay, Sauvignon Blanc, and Pinot Gris. The soil is a mixture of gravels and sand, glistening with silica. The vineyard was extended in 1998, devoted to new Dijon Clones of Pinot Noir. Fruit from managed vineyards is also used. Steve Davies is another Central Otago winemaker with a passion for Pinot, which he has made since he began in California and Oregon. He is a partner in the Carrick venture with Bill Arthur and Barbara Robertson Green. The beautiful and modern winery looks out to the rugged Carrick mountain range, and a really impressive restaurant offers breathtaking views from a sunny terrace whilst you enjoy the innovative cuisine of chef Rachel Keene. Central Otago’s newest estate has vineyards in the old mining country of the Bendigo region. Winemaker Paul Pujol (right) and I spent as much time clambering about the old gold mines as we did inspecting the vineyard, but what fascinating high country this is, the ground rich in clays and limestone, mixed with schist and quartz. Paul is a Kiwi who set off with a plan to make five vintages in five wineries, following the harvest north from the Languedoc. However, whilst with Kuntz-Bas in Alsace their winemaker left, and Paul was offered the job. It is almost unheard of for a foreign winemaker to join an Alsace family domain. Paul worked three vintages there, from 2000 to 2002, then two years at Lemelson in Oregon before heading home. 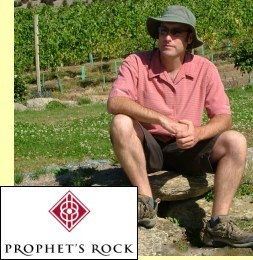 Prophet’s Rock makes its wines at Olsen Estate for now. Pinots Noir and Gris is planted on north facing slopes beside historic Goldrush settlements. The nearby Riesling vineyard has a foot or so of gravelly top soil and sand, over layers of calcified material and then a band of clay. Paul says he’d love to make his version of an Alsace Grand Cru there some day. He is also keen to plant Gewürztraminer, and to make a Passito-style Riesling using fruit drying facilities in nearby Cromwell. This is most certainly a name to watch. Next stop on my mammoth trip was to one of New Zealand’s most respected names, Felton Road. English owner Nigel Greening and winemaker Blair Walter greeted me, and we took a walk around their famous vineyard blocks 3 and 5, which sit behind the modest winery (pictured left). In 1992 the Elms vineyard was the first 14 acres planted on these Bannockburn slopes by the original owner, to Pinot Noir, Chardonnay and Riesling. Eight more acres at Cornish point followed, planted exclusively to Pinot Noir, as is a the neighbouring Calvert Vineyard, which they operate on a long-term lease. Viticulture is almost all by hand, and although not certified, farming is Biodynamic. Blair has made wine in New Zealand, Australia, Oregon, Napa, and Burgundy. For Pinot, he ferments whole berries using wild yeasts, with wines being rested outdoors in small fermenters for extended maceration. All barrels are Burgundian coopered, air dried for three years, with 30% new each vintage. If you turn up at the cellar door (afternoons only) it is more than likely that either Blair or Nigel will be around. Nigel claims to be the current holder of the Guinness Book of Records ‘Longest Commute’ title, shuttling between his homes in Devon and Otago. In 1979 he founded Park Avenue Productions, a company specialising in film production and engineering for special events. He has created special effects for everything from Disney to the Millennium Dome. He teamed up with Alan Brady (Mount Edward Winery) to buy his first vineyard in Central Otago and the rest, as they say, is history. Travelling all the way back up to the northern coast of South Island, one comes to the lush, green wine region of Nelson. A bountiful climate and geography have combined here to make Nelson, one of the sunniest spots in all of New Zealand, an agricultural paradise. Harvest here is always several weeks earlier than in Central Otago. Nelson’s reputation was built on Chardonnay and Pinot Noir, but the region has a growing reputation for aromatic varieties like Riesling, Pinot Gris, Gewürztraminer and Sauvignon Blanc, as well as for late-harvest and Botrytis whites. The Moutere Hills is widely regarded as Nelson’s best sub-zone, where an ancient river system has laid down gravel over clay soils. The Waimea region’s alluvial soils and maritime-influenced climate is also carving out a reputation for aromatic whites and Pinot Noir in particular. First stop in Nelson was an estate whose wines I’ve really enjoyed in the past, Neudorf. My host was owner Judy Finn, who with husband Tim, founded the estate in the 1970’s. Judy says “When we started we were regarded as ‘mad, wild hippies,’ and that banks told us to rear sheep, not vines.” But the Finns were determined not just to make wine, but to make great wine, and their reputation today is one of excellence. The home vineyard spills down a gentle north-facing slope on the Moutere Valley. The Valley floor is home to hop gardens, orchards and berry farms, but the slopes where some of Neudorf’s best fruit originates are shallow sandy loam overlaying a draining clay. All of Neudorf’s vineyards are based on weathered gravel. Naturally low fertility plus management of the close-planted vineyards mean yields as low as one kilogram per vine for their top Pinot Noir. Winemaker Tim produces just 12 – 15,000 cases per year. Judy says their focus is on “texture, balance and complexity,” with as little as 148 cases of the fabulous Home Vineyard Moutere Pinot Noir produced. Pinot Gris is “Like painting a white wall with a white brush,” according to Judy, so it has the same low-cropping regime as their Pinot Noir to encourage complexity. And so to my final stop, where winemaker Chris Seifried and his mother and father, Hermann and Agnes, have been making wine since 1976. Austrian born Hermann planted no fewer than 14 varieties on that first two hectares, though the estate now runs to 200 hectares, concentrating on Sauvignon Blanc, Chardonnay, Pinot Gris, Riesling, Gewürztraminer, Pinot Noir and Syrah. Though his dad is still closely involved in winemaking decisons, Chris, with experience in Australia, Oregon, and Europe under his belt, is in day to day charge of the winery. An ongoing task for the Seifrieds is to continue expanding their own estate vineyards, and reduce their reliance on outside growers. I toured a vast new vineyard planted not far from the winery with Hermann, complete with a cleverly sunken hillside reservoir that harnesses water, without scarring the landscape. The estate is Nelson’s first to acheive Sustainable Winegrowing accreditation, and their winery, dating from 1996, uses gravity for much of the wine movement. With a busy cellar door and restaurant, the Seifrieds seem to be pushing as hard as ever, 30 years on.